At HottieBodyJewelry Complete Customer Satisfaction is our #1 Goal! We LISTEN to what our customers have to say and we invite your comments, suggestions and contributions. Reality Check By Robin #2: Should I Take The Jewelry Out? Body Piercing Done Right The First Time in Lancaster, Ca. The Best Body Piercings in Lancaster, Ca - Period! Semi-Colon Tattoos in Lancaster, Ca. for only $20 at Hottie Body! Semi-Colon Tattoos in Lancaster, Ca. for only $20 at Hottie Body! Who else in the Lancaster, Ca area offers NO SHOP MINIMUM TATTOOS and even will bother with any kind of tattoos priced below $50? Hottie Body, that's who! 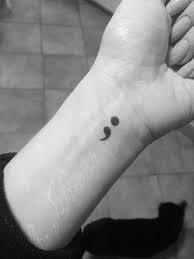 We are the only shop around that consistently sets the bar for excellence and value and we will do a semi-colon tattoo (up to the size of a quarter) for only $20 ANYTIME! We have built a reputation amongst our customers for caring more about the work and their safety than money, and maybe that's why we are rated #1 in Customer Satisfaction for six years in a row (since 2009) and running! Stop into Hottie Body today for the absolute best tattoos and body piercings anywhere at any price done by our all-female artists and piercers - Hottie Body, where we treat you like family! Copyright www.hottiebodyjewelry.com. All Rights Reserved. eCommerce Software by 3dcart.